The Spencer Hotel Dublin (formerly The Clarion Hotel Dublin IFSC) is located in the International Financial Services Centre in the business centre of Dublin city. This hotel is a perfectly situated for business or pleasure with spectacular views of the River Liffey. It is close to all the cities top visitor attractions and only a short walk to the 3Arena (formerly the O2 Arena). This hotel has a fitness club, an 18-metre indoor swimming pool and a Beauty Spa with a wide variety of treatments. There is secure parking nearby for a daily fee. 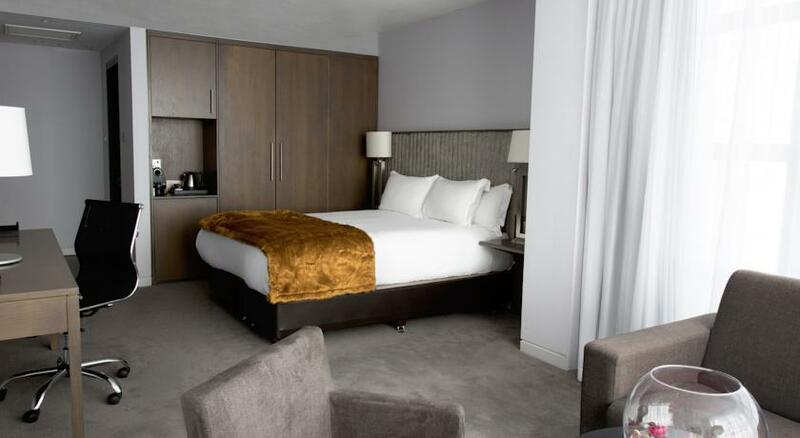 This Dublin Docklands 4 star hotel has 180 air-conditioned rooms with power showers, room safes and comfortable Respa beds with Egyptian cotton linen. Floor to ceiling windows give excellent views of Dublin city. In room facilities include High speed free Wi-Fi, Digital TV with numerous national and international channels, hairdryers, iron & ironing board, Tea/Coffee machines and I-pod docking stations. A 24 hour room service and a laundry & dry cleaning service is available. Room configurations include Double, Double with a single bed, Family room (2 Adults + 2 Children), Executive Twin Suite and Executive King Suite. All rooms are ensuite and room facilities include Flat Screen TV, fast Wi-Fi Internet access and 24-hour room service. The main restaurant at The Spencer Hotel Dublin is the East Restaurant which serves lunch and evening meals mainly Asian including from Thailand, Indonesia, Malaysia, Vietnam, and Japan. The Zen Garden is a relaxing area where snacks, bar and restaurant menu and cocktails ar available throughout the day. The Pantry is where breakfast is served. A selection of cereals and fruits followed by a hot buffet serving full Irish breakfast is available here. Situated in the Docklands area of Dublin city right on the River Liffey the Spencer is just a 10-minute walk from the 3Arena (also a Luas tram stop behind the hotel to the 3Arena), Convention Centre and Bord Gáis Energy Theatre. O’Connell Street is about 10 minutes walk and is also accessible by tram.